Blue Manta is the youngest member of White Manta Fleet. This boat joined the fleet in 2014. Blue Manta liveaboard has everything to make your diving trip to Indonesia great. 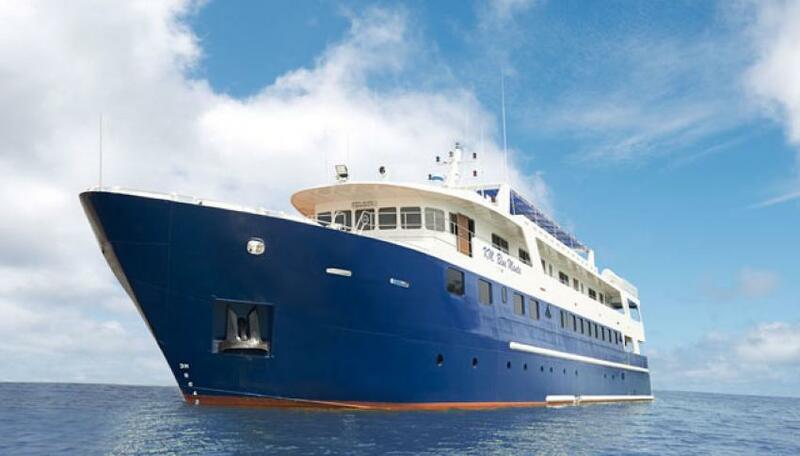 Blue Manta Liveaboard has 14 cabins that can welcome 28 divers and their fellow travelers. All cabins have private showers and all are spacious. Upper deck staterooms have big portholes in addition to observing the view. Lounge area of Blue Manta is nice and cozy, it has comfortable sofas to relax after dives. Also, passengers can watch the TV here. Meals are served in open air diving area. Boat's sun deck is perfect to enjoy marine scenarios. It has shaded part, where you can read a book. Plus it has numerous of sunloungers. Big and spacious dive deck of Blue Manta is comfortable for preparing for the dive. It is equipped with storage boxes. Safety on board is one of the main concerns of crew team of Blue Manta Liveaboard. Boat equipped with fire and smoke alarms, life rafts, life jackets, first aid & oxygen kit. Diving itineraries of Blue Manta include visiting of Komodo Island, Raja Ampat, Forgotten Island. Komodo Nationals Park is good for macro diving, there are lots of nudibranchs, pygmy horses and other tiny species here. Also, it is represented by colorful coral walls and mountains. Raja Ampat won’t leave anyone indifferent. This diving destination represented by a huge diversity of coral species and fish. Diving on Komodo is possible all year round, high season for this destination begins in April and lasts till August. For Raja Ampat, the best time to dive is from October until the end of April.